This was NOT Young Adult fiction. I think people on Goodreads need to realize that just because a novel features young adults, that does not automatically make it YA fiction. This book contains mature content, and some very colourful language. With that rant out of the way, The Death of Bees was like nothing I've read this year. NOTHING. Told in short, multiple-perspective chapters, this novel held a proverbial pillow hovering over my face, I was THISCLOSE to suffocating under the strength of it's story. Marnie is 15, SO close to 16. Nelly is 13, going on 64. Two sisters, one desperate attempt to recapture normalcy, and put the past behind them, or in this case...beneath them. All the while Lennie watches, a neighbour who becomes consumed with wanting to care for the two young girls, after what he assumes was pure and simple abandonment by their parents. Carrying the weight of his own baggage, Lennie becomes an adoptive grandfather of sorts, and the girls begin to depend on him for the love they never received from their own flesh and blood. "I'd hoped he'd be nice. He's delightful. An amusing type of a fellow and a real sport. He serves crumpets with curd and plays Beethoven and Bach. He is a fine pianist and we are quite the duet." I wore my heart on my sleeve during the entire reading of The Death of Bees (wait..I JUST realized that this title is meant to be a parody of The Life of Bees!.. *sigh* so slow on the uptake I am). I have NEVER read a novel that so thoroughly beat around bushes. It was obvious that Marnie and Nelly had a disgustingly horrid childhood, but you're only given that idea in snippets of memories about their parents; small glimpses into a life that they'd rather forget. Instead, you're left reading through a narrative that's FULL of obvious cries for help: in Marnie's shocking promiscuity, and Nelly's refusal to accept her developing body. It was immense. It was humour, layered over fear, layered over heartache, layered over a vulnerability like I've never seen in characters before. Lisa O'Donnell is a fantastic novelist. I felt like I was reading a whole new genre, a completely different form of writing-I didn't know whether to laugh, or cry, or just sit there..completely still, and take it all in. I can't wait to see where she goes from here. Recommended for Fans of: Dark Humour, Contemporary, Mystery, Adult Fiction, Controversial Issues. Authors: Chuck Palahniuk, Christopher Moore, Kurt Vonnegut, Tana French. Lisa O’Donnell winner of The Orange Prize for New Screenwriters with her screenplay The Wedding Gift in 2000. Lisa was also nominated for the Dennis Potter New Writers Award in the same year. She moved to Los Angeles with her family in 2006, penning her first novel The Death of Bees in 2010. 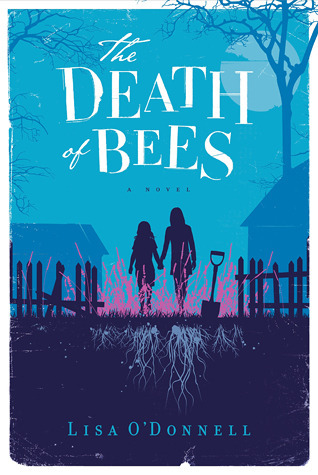 Published to critical acclaim by Windmill Books in 2012 The Death of Bees will be published in the US by Harper Collins January 2013. The author is very excited!!!!!! WOW! "It was humour, layered over fear, layered over heartache, layered over a vulnerability like I've never seen in characters before." Man, if I was an author and someone wrote that about my book, I'd be PUMPED. What a cool way to describe a book. It certainly makes me move it up on my own list!